They kneel. They pray. They get arrested. Just two days into the gig, and Jay Carney – the new White House spokesman – gives us two shining examples of twisting the truth in a grand attempt to rewrite history … or just forget it all together I guess. There’s been talk of serious Congressional hearings getting going once the Republicans take control of the House, Senate or both starting in early 2011. Please, no. I’m serious, I’m not interested in hearings about the transparency or lack there of in the current Executive Branch. Via Newsbusters. I mean pleaaaaaseeeeeeee. Well at least she’s honest, unlike her compadres at MSNBC. Some of you will be outraged, but don’t be. We’ve know they have been in direct contact with the White House the show for some time now. It’s just … well, it really is an outrageous admission. https://radioviceonline.com/wp-content/uploads/2010/06/frontpg-mika-brzezinski-smu.jpg 225 150 Jim Vicevich https://radioviceonline.com/wp-content/uploads/2011/02/rvo-logo-4-300x100.jpg Jim Vicevich2010-06-21 10:07:592010-06-21 10:34:49Mika admits, "I'm working with the White House"
Gov. David Paterson (D-N.Y.) is not at all on board with Attorney General Eric Holder’s decision to have five Sept. 11 planners brought to New York City for a civilian criminal trial. Supposedly Holder made the decision, and he informed President Obama. Why is Paterson saying the White House warned him this was coming six months ago? Ya just never know with the young president. One day you’re his enemy, the next day, your best friend. We’ve seen it all before. Today the president gathered doctors representing the AMA (and a variety of the medical organizations) to show how MDs support his health care plan. The lab coats are a nice touch, cause otherwise we would have to take his word for it that they are actually doctors. All style no substance. Yes Mr. President, and they have seen what happens when they go after your tonsils. And they’ve seen what happens when they go after your feet or something. It should be noted that the AMA does not represent the vast majority of doctors … and remember this is the same AMA that opposed single payer now suddenly in the fold. For a good take on where doctors stand on single payer … consider IBD’s poll from a couple weeks ago. I know … an NPR poll shows exactly the opposite. But the doctors who conducted the oft quoted NPR poll admit the survey was random and not scientific, conducted by phone and mail. The point is if the president thinks he can sway public opinion by displaying 50 150 people in lab coats on the WH lawn … my guess is he’s missed his mark. It’s hard for people to take seriously a president who one month ridicules doctors for being dollar driven and the next month cozies up next to them as models of altruism. People just naturally question credibility. Update (Steve): The New York Post has some background on the White House Obama photo op, confirming what I figured yesterday. The photo op – with all of the docs in white lab coats – was staged. The White House handed out the lab coats. 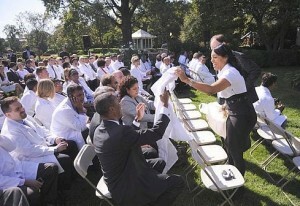 Note: The docs were asked to wear lab coats, many did not and were issued the uniform of the day by White House staff. So, who paid for the lab coats? Did the docs get to keep them or will they be stored for the next photo op with health care professionals? Click on the image to enlarge. Morrissey over at Hot Air also highlighting. Malkin too. https://radioviceonline.com/wp-content/uploads/2011/02/rvo-logo-4-300x100.jpg 0 0 Jim Vicevich https://radioviceonline.com/wp-content/uploads/2011/02/rvo-logo-4-300x100.jpg Jim Vicevich2009-10-05 19:35:482009-10-06 11:47:15Obama: I like doctors, see?